When we talk about “edibles,” we mean cannabis-infused foods, available now for any adult over 21 years of age in California. 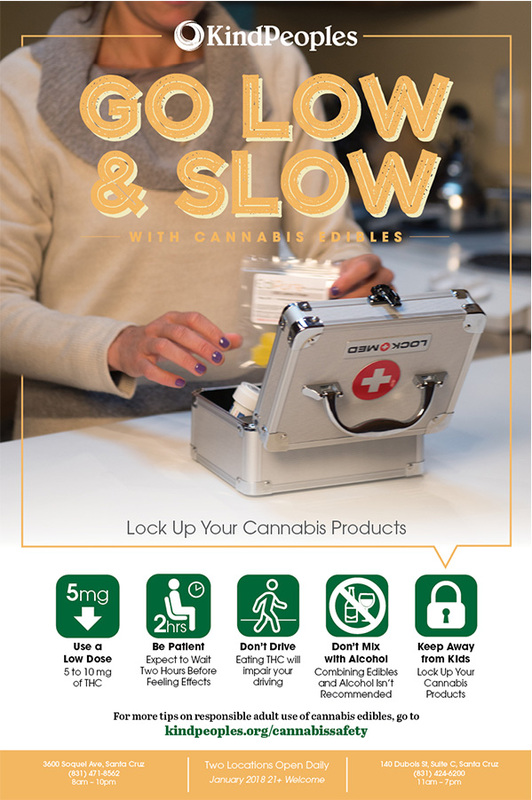 Cannabis or hash can be added to almost any food or drink, including baked goods like brownies and cookies, chocolates, candies and gummies, granola, mints, and juices. The variety is endless, with new edibles debuting constantly. When trying these products, it’s important to educate yourself first, since you want to have the best possible experience. Edibles can be intense, and eating too much THC can be very unpleasant and disorienting. Finding the right dose is essential to accessing these positive experiences. We recommend starting with no more than 5 milligrams of THC for new users. If 5 milligrams doesn’t result in noticeable effects, slowly increase your dose to 7mg for the next experiment. Look for information about CBD content listed in milligrams as well. CBD isn't psychoactive, but it aids in relaxation, making products with a high CBD content ideal for new users. Many products will list a ratio, such as 1 to 1, 4 to 1 or 20 to 1; which indicates the ratio of CBD content to THC content. For instance, an edible with a 1:1 ratio contains an equal amount of THC to CBD. Adding CBD to your diet is a great way to enjoy a balanced high! Start with a low dose of 5mg of THC. Go slow, waiting for at least two hours to feel effects. Walk, don't drive! 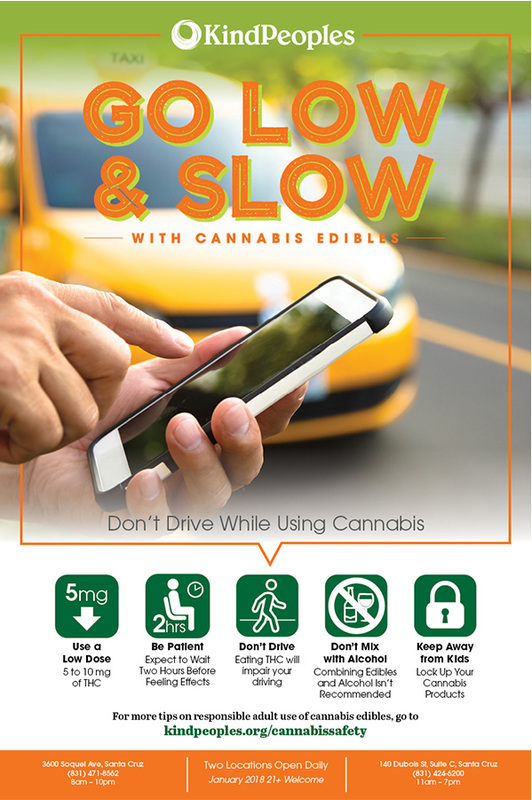 Never drive or operate machinery after consuming edible cannabis. Avoid alcohol. Don’t mix edible cannabis with alcoholic drinks, since doing so can make you feel very disorientated. Keep Away from Kids and Pets! If you are a parent with young children, it’s recommended that you choose cannabis products like capsules and tinctures that don't resemble any type of food. Symptoms of "overdosing" on THC can include an elevated heart rate, increased anxiety or panicky feelings. If you experience these symptoms, make sure to find a safe place to relax and calm down. Practicing deep, slow breathing can help you relax, and wait for a few hours to pass. Another cannabinoid present in herb, CBD is known to balance THC and can mitigate the worst parts of a too-intense THC high. A few hits from a CBD-rich vape pen can help calm you down. Other homemade antidotes include inhaling and/or chewing on black peppercorns, which contain a terpene called carophyllene, known to provide relief for those who are too high. With some common sense education, any responsible adult can enjoy cannabis-infused foods. That's why KindPeoples launched the "Go Low and Slow" campaign to inform our community and encourage the safe use of cannabis products. 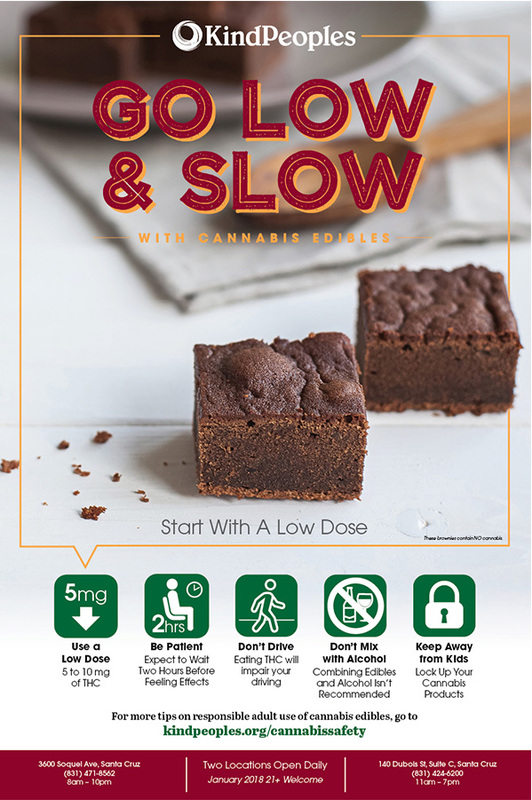 Always remember to “Go Low and Slow” and you’ll have an enjoyable edibles experience every time!